The Locusts are back in town for a few days, after chewing their way through Shanghai over the last few days. Besides whatever personal business that they're up to this time around, the other important activity on their minds is clearly munching. 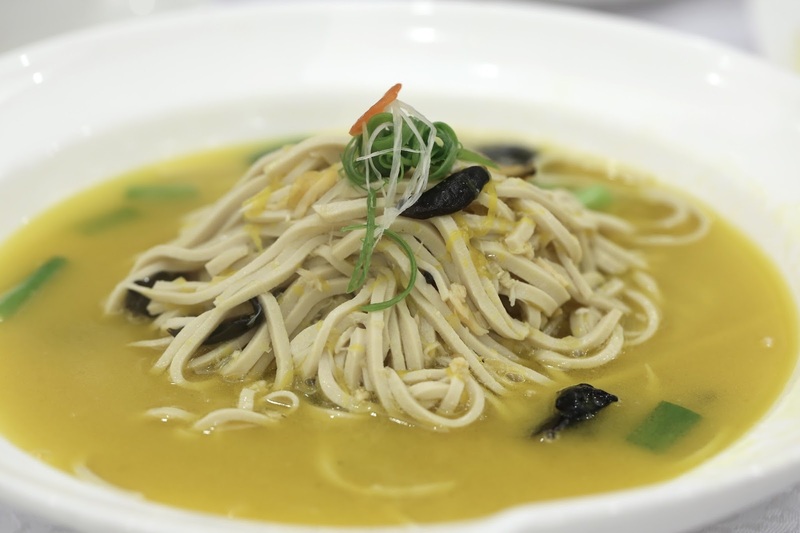 I asked the Locusts for a list of places they were interested in hitting, and when I was told that Shanghainese food was high on their priorities list, I knew that I wanted to use this opportunity to revisit Jiang Su (江蘇薈). This is a members-only club I was introduced to a couple of months ago, and I was so impressed by it that I've been dying to go back. Since I have yet to cough up the money to join as a member, I had to ask my friends to help me book a table... and to come along for the ride. We had Mrs Locust do the ordering for the first round, since they don't get any decent Shanghainese out where the angels live, and supplemented with a couple of dishes that I enjoyed on my last visit. 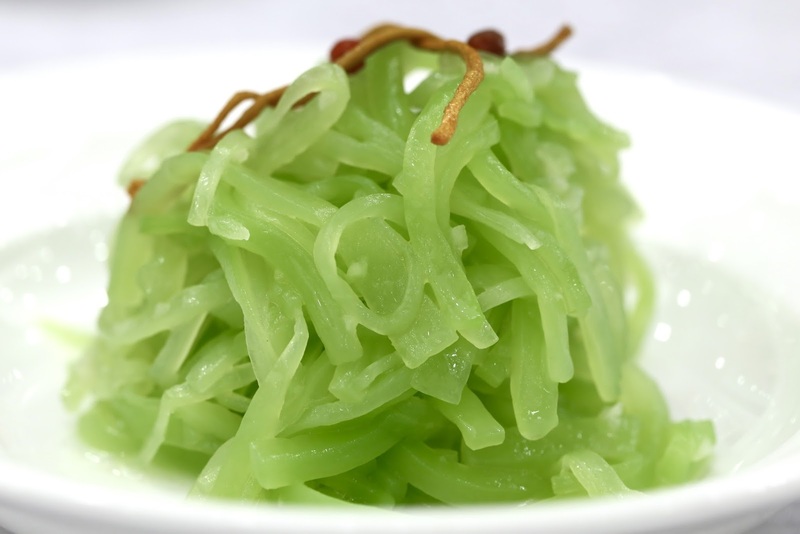 Marinated celtuce stem with spring onions (香蔥萵筍) - Hello Kitty requested this as she really liked this last time. 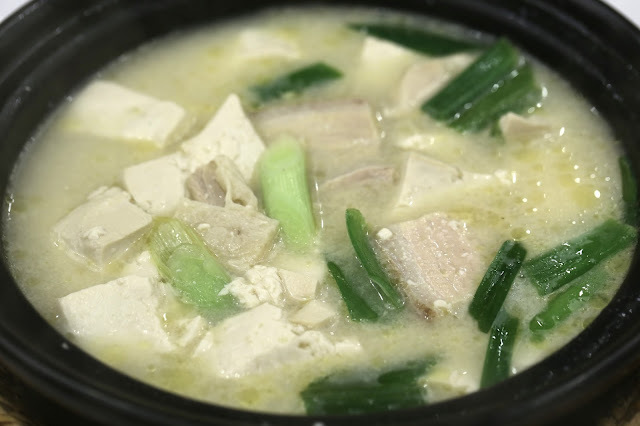 While this may be new to some, I grew up with mom's Shanghainese food and this was something we had regularly... especially in the summer when it is served cold to retain its crunchy texture. All it needs is some sesame oil along with a little bit of diced spring onions. 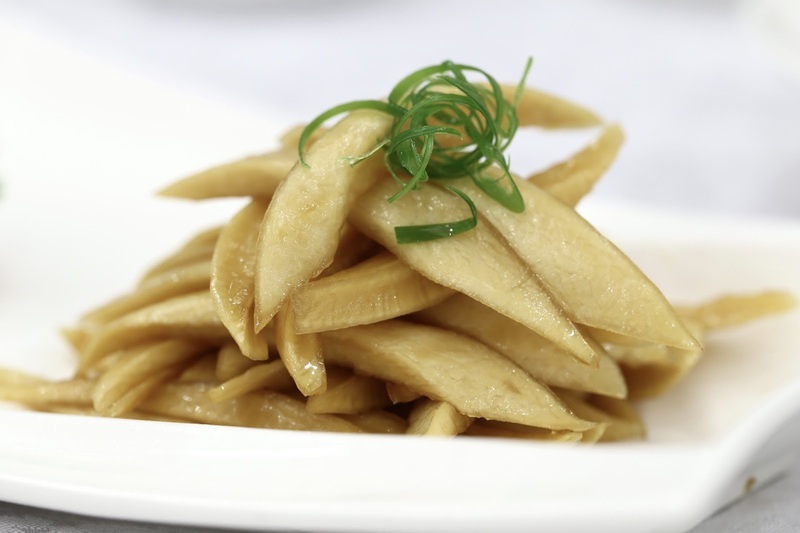 Marinated organic radish (天水有機醬蘿蔔) - this was a dish I remember well from the last visit. Marinated or pickled radish might seem ordinary and even be seen as a condiment, but these were very, very tasty and sweet. And crunchy, too. So good that we ordered a second plate the last time I was here. Steamed lion's head meatball (清燉獅子頭) - these were totally unlike mom's, as they had not been browned at all. Lots of diced water chestnuts (荸薺) and also chunks of pork fat mixed in with the minced pork, which gave a very soft texture overall. Thick cut beef with secret sauce (厚燒密制牛肉) - this was not bad. Most of the pieces were tender enough, and there was plenty of thick, rich sauce that delivered a sweet taste along with a variety of spices. Shredded tofu with hairy crab roe (蟹粉撈干絲) - surprisingly good. The shredded tofu (干絲) had a lot more soybean flavor than I had expected, and was even a little smoky. In addition to the crab roe sauce (which included crab meat) there was also plenty of wood ear fungus. 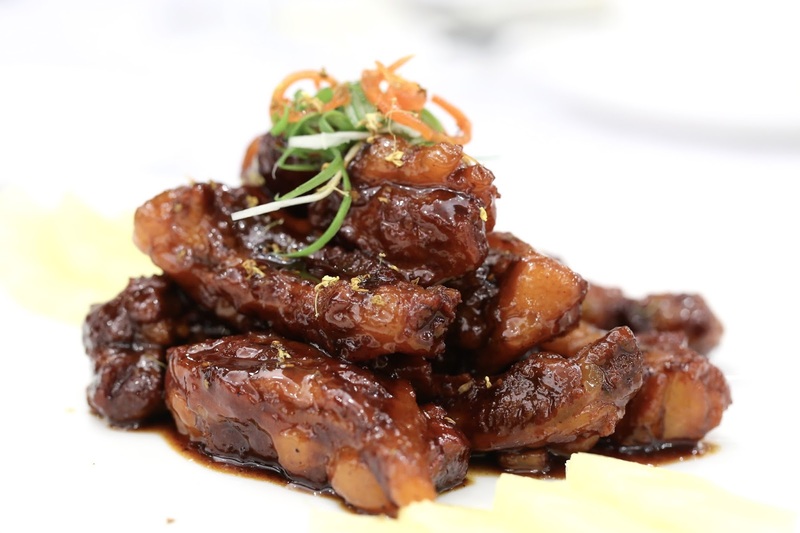 Sweet pork ribs (無錫排骨) - very classic, with a different rich and thick sauce delivering flavors that are on the sweet side. 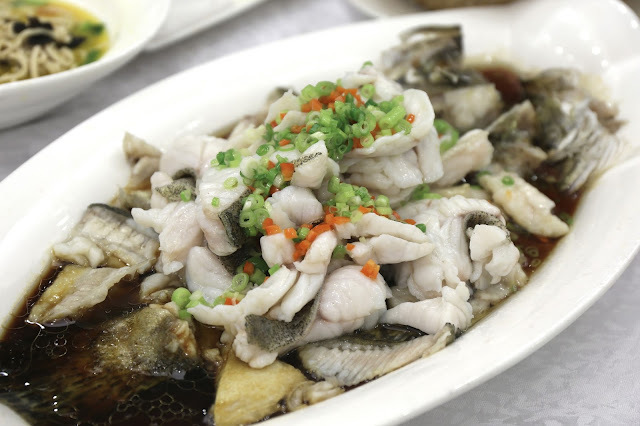 Stir-fried mandarin fish with spring onions (蔥椒長江桂魚) - I'm normally not a fan of fish in Shanghainese cuisine, but did not put up a fight when Mrs Locust wanted some. Since Mr. Locust had balked at the price of a whole Reeve's shad (鰣魚) and didn't insist on ordering one, we ended up with the mandarin fish... which was boned and filleted before a quick stir-fry. I wasn't the least bit surprised when this fish from the Yangtze River showed a little muddy flavor, which kinda marred the experience a little. Braised omelet with tripe and napa cabbage (肚絲白菜燜蛋餅) - this was surprisingly good. Nothing fancy here, but the light and clean flavors all came together. 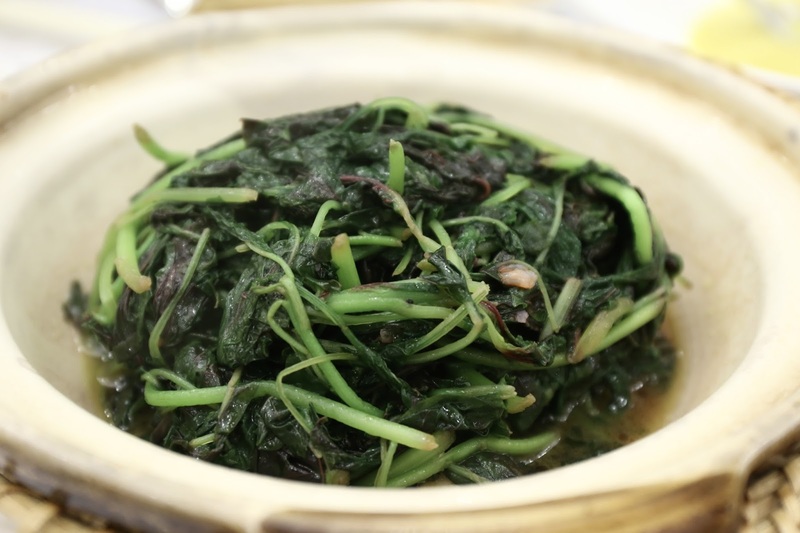 Braised leafy amaranth (家燜米莧) - I don't think I've ever had leafy amaranth cooked in this much grease before, but the young shoots were very tasty. 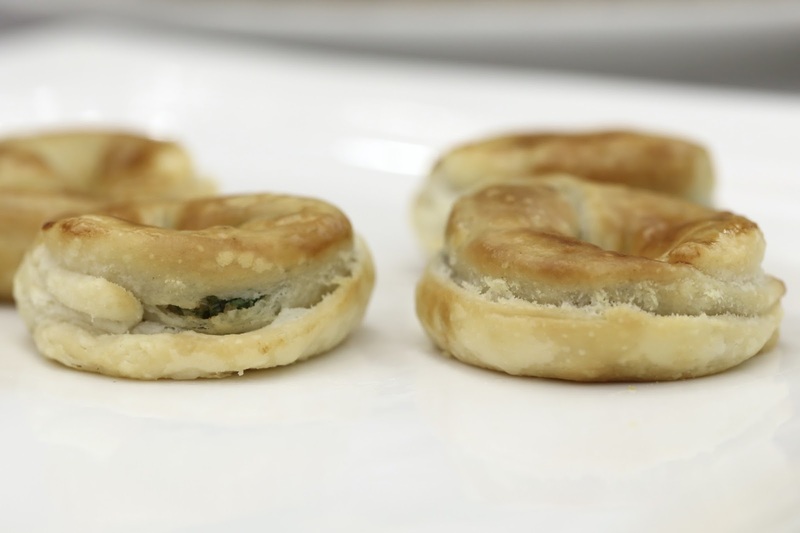 Mini spring onion pancakes (迷你蔥油餅) - these have got to be the smallest pieces of spring onion pancakes I have ever seen, but they were pretty decent for ones that have been baked instead of pan-fried. Eight treasure rice (發財八寳飯) - not something I would normally order, but I found myself enjoying it. 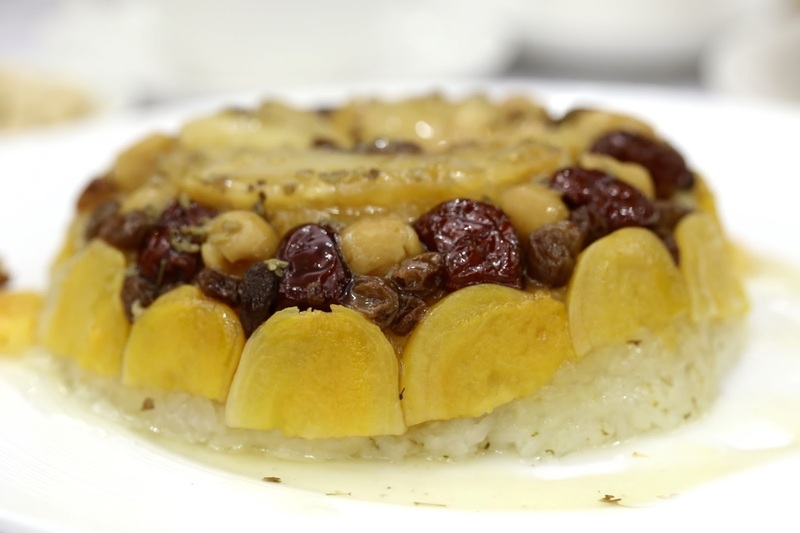 I think the dried apricots, caramelized pineapple and the osmanthus sauce all helped to make it a little more fruity and light. 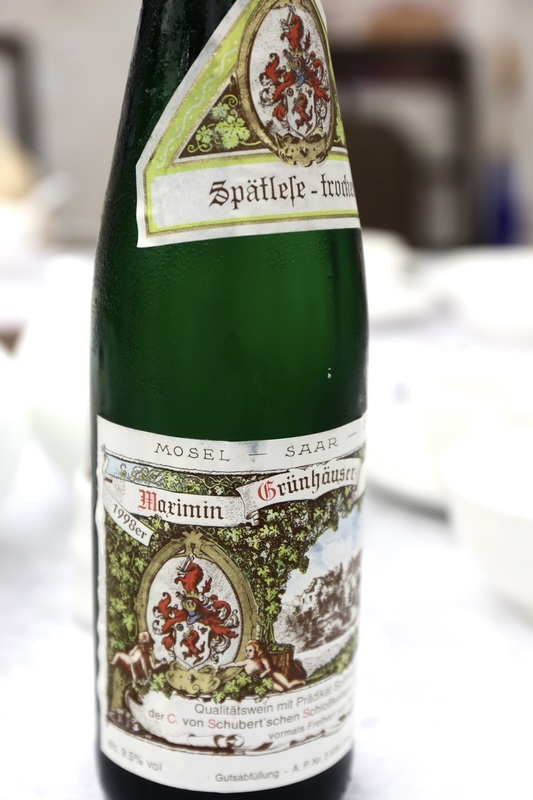 1998 von Schubert Maximin Grünhäuser Abstberg Riesling Spätlese-trocken - big nose of petrol and polyurethane, but riper, fuller, and richer, with lots of muscat grape. 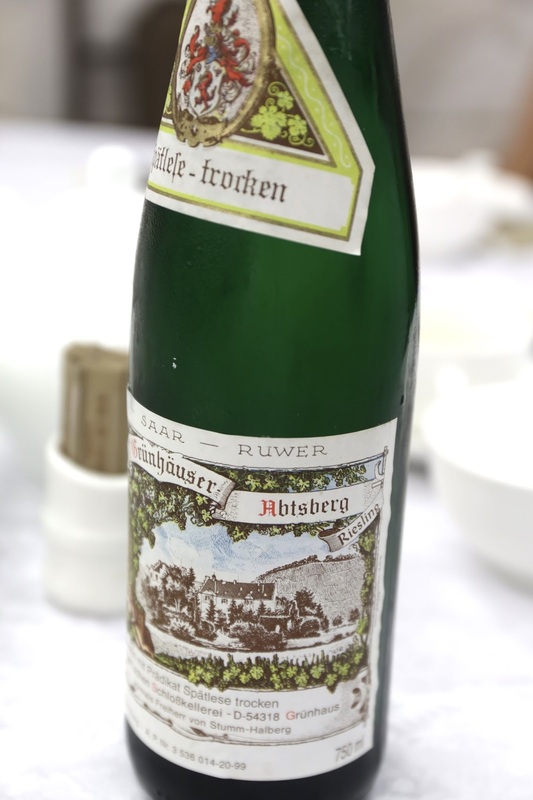 Dry finish with plenty of acidity to balance the full-bodied palate. 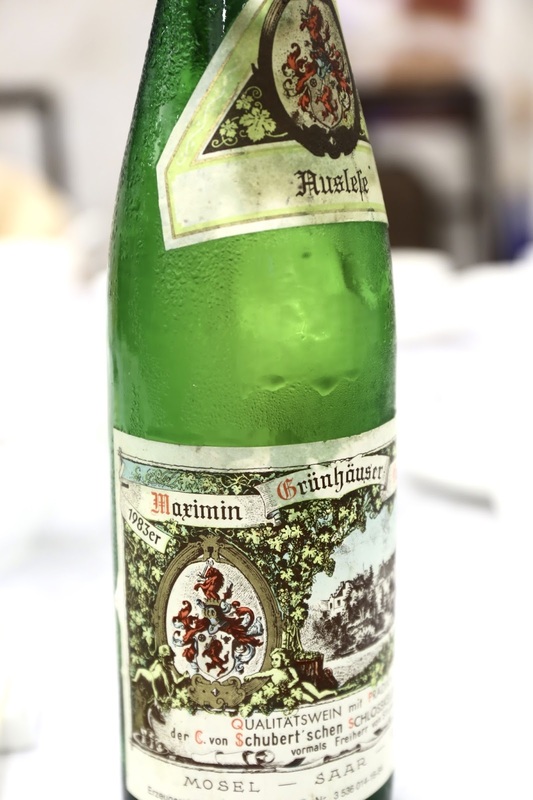 1983 von Schubert Maximin Grünhauser Herrenberg Riesling Auslese - obviously riper on the palate and much more mature, with plenty of acidity to balance the sweetness that wasn't at all overwhelming. 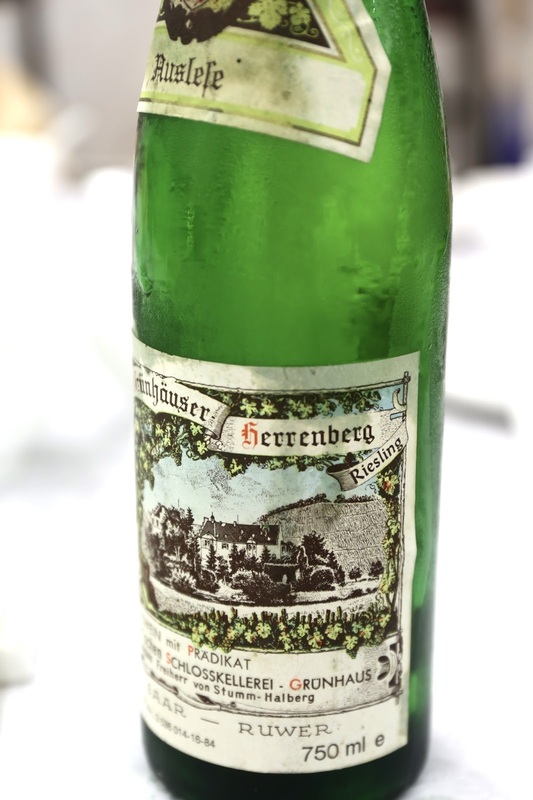 Lots of lemon and marmalade on the nose here, along with some minerals and flint. 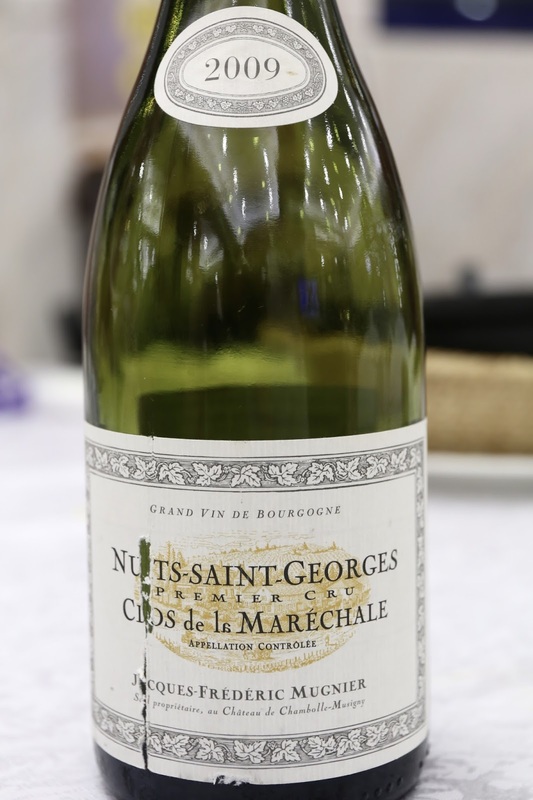 2009 Mugnier Nuits-Saint-Georges 1er Cru Clos de la Maréchale - nose of eucalyptus, game meats, lots of leather and animal notes, with a little floral violet underneath. Slightly pungent. Once again I really loved the food here. Nothing really fancy on the menu, but just lots of simple dishes made with fresh ingredients. Gotta come back more often! The thick cut beef and eight treasure rice look delicious.